Voltaic Systems solar technology shines as a convenient way to keep batteries charged and carbon footprints low. 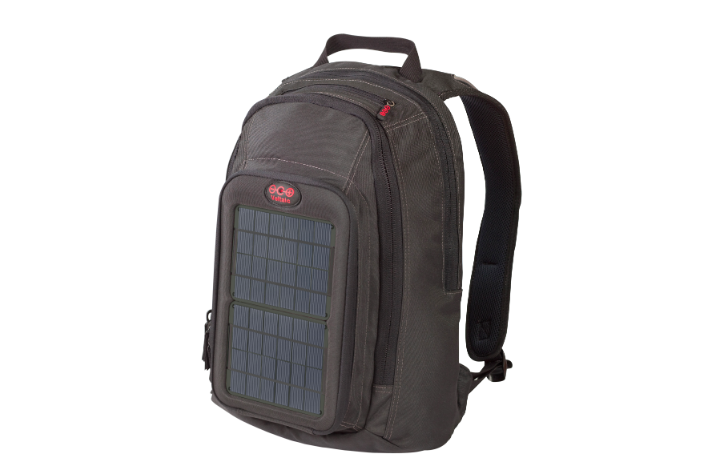 Its line of energy producing backpacks belongs on any eco-conscious consumer's "must-have" list. With society's ever-increasing dependence on tiny wireless devices for communication, entertainment, and navigation, the biggest inconvenience many travelers now face is the elusive power outlet. Whether you need a charged cell phone for a day trip or an international adventure, it can be a challenge to find a place to recharge your electronics. 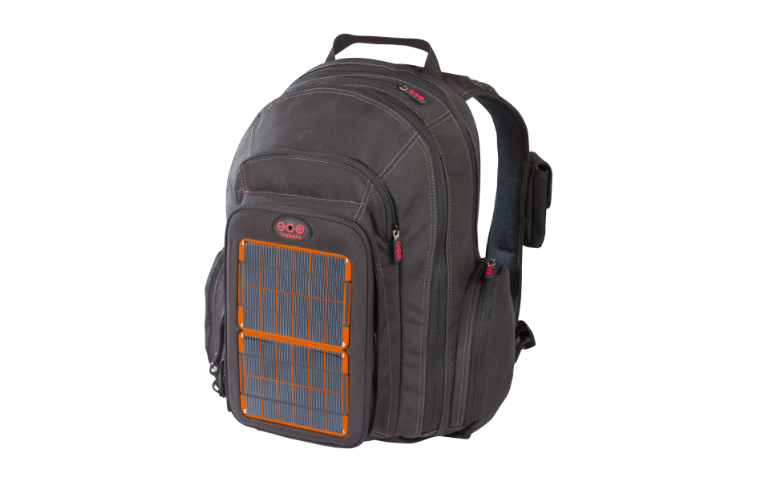 Voltaic Systems has created solar powered backpacks and laptop bags that harness the sun's energy using solar panels on the face of the bag. Employing a matrix of deftly hidden wiring, the solar "juice" is channeled to a small battery pack or directly to your device. There are multiple varieties of bags, cases, and carriers available, ranging from $99-$399. The two backpacks on sale are the OffGrid ($229) and Converter ($149). Made from 100% recycled soda bottles (PET), the Voltaic bags appealed to us from the get-go with their "green" friendly form and function. Included with the handy packs are a converter and two adaptors. When you do find a stationary power source, you can charge your battery pack in preparation for a trip and then any time spent in the sun will help to keep your battery pack fully charged. Without any wall or car charging, the battery needs about 8-10 hours of sun exposure to become fully charged but you can start charging a device as soon as the pack is receiving solar energy. However, don't be distraught by a cloudy day. The pack merely needs exposure to the outdoors to begin charging even if the sun appears to be hiding. FTF’s green staff previously reviewed an older model of the Voltaic Systems solar bag, and we found that when left sitting against a sliding door that receives sun exposure, the battery still was able to achieve full charge from indoors. The bag is made to withstand all kinds of outings. For bathing suit bedecked families who spend the whole day on the beach but need to stay in contact with the fully-clothed world, the backpacks can easily receive enough sun exposure to charge cell phones, small cameras, GPS's, iPods and iPads. Previous tests of Voltaic products have left our green staff content — even a jaunt on the beach proved satisfactory. The continual assault of sand and a few sporadic thunderstorms served as a good test of durability and functionality. Inevitably, sand found its way inside both main storage compartments and the two smaller side compartments of the bag, but neither the battery nor any of the wiring seemed to be affected and the waterproof, scratch-resistant solar panels (which are on all newer models of the bag) were not harmed by a brief summer storm. The bag also makes for a nice safety on a trip into the city. Although slightly heavy when stuffed to capacity, it’s hard to argue with a bag that manages to hold its own solar panels, wiring, and battery pack — and it’s super convenient to have our mobile fully charged and easily accessible all day long in a new city. The informative website contains detailed directions and pictures that can help you decide which voltage to use or which adaptor fits your phone. You can also use the site to purchase replacement parts or additional adaptors if need be. And, the two-year warranty covers any potential malfunctions or broken bag or panel parts, though the battery itself only has a one-year warranty. Voltaic Systems also frequently has a "Buy One Give One" promotion in which you can order specific products for yourself, like a solar lighting kit, and then have one installed in a village in the Peruvian Andes on your behalf. 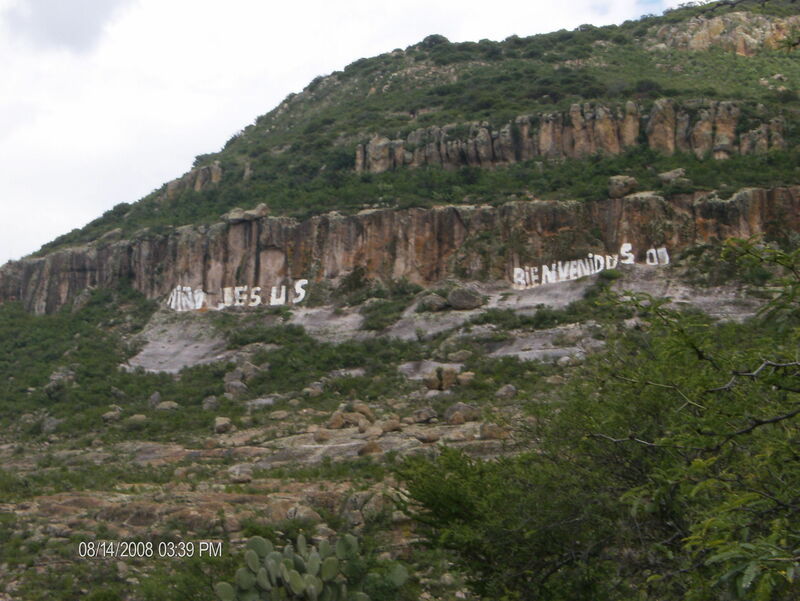 So what are the drawbacks? The universal adaptor won’t fit every single cell phone or PDA on the market and you need to know the voltage requirements of the gadget you are charging. You can usually find the voltage requirement marked next to the DC power-in plug or by checking your owner's manual. It's important not to use more voltage than necessary because too much power can cause damage. While the look is not exactly "chic" and the price seems a little hefty, remember that this is more than just a simple book bag. The bottom line? When you're on the go, this backpack is a convenient, useful, and (most importantly) a sustainable way to stay connected.